Regular laundry detergent may not be strong enough to kill persistent mold spores. Some people believe in using holistic additives like vinegar, neem oil, tea tree oil, castile oil, or baking soda. While there are antifungal properties in each of these natural ingredients, there are unfortunately no studies proving or disproving their effectiveness. What About Bleach? Does Bleach Kill Fungus? To Kill Athlete’s Foot Fungus, The Water Must Be Hot, Hot, Hot! A report published in the International Journal of Dermatology in July 2013 found that washing clothes in lower water temperatures fails to eliminate live fungal spores from clothing. This new trend caught on as homeowners look to save money on their utility bills, but they could be putting themselves in danger of foot fungus transmission and re-infection, according to a study from Israel. Researchers sampled 81 socks worn by patients with tinea pedis (athlete’s foot) and washed them at 104 degrees Fahrenheit and again at 140 degrees Fahrenheit. They found that 36% of the socks washed at 104 degrees tested positive for live fungal cultures of Aspergillus, a type of mold that may cause toenail fungus. Only 6% of the socks washed at 140 degrees still contained Aspergillus. Athlete’s foot fungus, Trichophyton rubrum, was found on four socks washed at 104 degrees, but no socks washed at 140. Study authors said the study confirmed their opinion that washing clothes at high temperatures is essential for killing fungal pathogens. “We consider that uses of other modes of disinfection, such as UV devices, should be considered as standard applications in domestic washing machines,” they added. Until that day comes, you can run a 45-minute cycle with your SteriShoe device to kill 99.9% of the fungus in your footwear with UV light — and run another cycle with your fungus socks inside the shoes to kill the pathogens there, too. I’ve seen other information online that borax is an anti-fungal but not any scientific data that supports this. 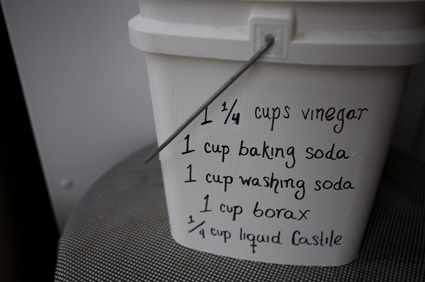 Where did you get your information that borax is an effective anti-fungal laundry booster? You must not have gotten it from 20 Mule Team that you have a link to because when I called the company, the person who answered the phone said their product is not anti-fungal, that it is just a booster to get stains out. But admittedly, it is very difficult to find reputable scientific data on this! We only feel comfortable really suggesting that Borax may have “antifungal properties.” That’s about as good as it gets.